General Motors Corp. is taking on something beyond one of the largest recalls in auto industry history — GM is challenging its industry peers to do the right thing – build cars in a sustainable, energy efficient, responsible manner. “People care about more than the cars,” said GM CEO Mary Barra in the automaker’s corporate environmental and sustainability report. “They care how we build them, and how we engage with the world around us. This knowledge, and the discipline that flows from it, is transforming our approach to product design, manufacturing, safety, quality, the environment, customer care and a host of other areas at a remarkable pace,” Barra said. For several years, GM has taken on that challenge in its manufacturing plant landfill and energy efficiency campaign; that saved the company $162 million in combined energy costs last year. Good examples of it came from removing coal-fired boilers at its Detroit-Hamtramck assembly plant, and saving $10 million in annual energy costs by using landfill gas at its Fort Wayne and Orion assembly plants. Another recently announced accomplishment was the installation of its 401st electric vehicle charging station at its US production and business facilities. More than 20% of the stations use electricity powered by solar canopies so that employees can cleanly charge their Chevrolet Volts, Spark EVs, and Cadillac ELR plug-in hybrids. Interested in earning California cap-and-trade credits, or entering the California Air Resources Board’s (CARB) cap-and-trade carbon credit auctions? ICIS and Environmental Leader are hosting a one-hour carbon market webinar on June 4, 2014, at 2:00 EDT. That came out of California’s Assembly Bill 32 and is still in its early phase, and transportation is part of it. CARB has set up several market instruments to help companies manage their carbon compliance obligations, which means purchasing California Carbon Allowances. Learn more and register here. Green Auto Market now has an affiliates shopping page linking readers to participating services. Affiliates include the Zipcar car sharing service, the TrueCar pricing and information website, TigerGPS driving navigation, K-Tor Generators human powered portable energy, Advance Auto Parts, and others. Electric Drive Transportation Association (EDTA) held its annual conference last week in Indianapolis. One of the central topics was the EV Everywhere Grand Challenge; that’s the US Energy Department’s 10-year vision to enable the US to be the first nation in the world to produce plug-in electric vehicles that are as affordable for the average American family as today’s gasoline powered vehicles by 2022. And read the feature article below on EDTA’s partnership with Andretti Formula E.
BMW is banking on carbon fiber to make its plug-in and other models more energy efficient, but carbon fiber does have its share of critics. They’re saying that the supply chain is too long and isn’t eco-friendly. BMW makes the case that its lightweight material holistically reduces its carbon footprint. Hands-free, wearable computer eyeglass Google Glass is working with SemaConnect in offering an app that locates electric vehicle charging stations. But that only applies to SemaConnect’s ChargePro network that only has about 300 US and Canada charging stations so far. The bad news from Navigant Research is that light-duty vehicle sales will grow from nearly 84.1 million in 2014 to about 127 million in 2035. The good news is that the market analyst firm predicts that less than half of them will be conventional internal combustion engine vehicles. Light duty stop-start, hybrid, plug-in hybrid, battery electric, natural gas, and fuel cell vehicles will make up a large share of it. Navigant Research also predicted that biofuels will make up 7.5% of the fuel mix for road transportation by 2022. That percentage will be made up of ethanol blends, cellulosic feedstock biofuels, biodiesel, drop-in biofuels used in aviation, and other advanced biofuels. It’s coming from concerns expressed by many governments, corporations, and individuals who see biofuels as a promising solution to solving the energy security, environmental, and economic challenges associated with petroleum dependency. Green racing events continue to be a strong platform showing off breakthrough vehicle technologies and clean fuel potential. They’re helping increase public awareness (and coolness) for green vehicles and are vital testing grounds for the technologies. Last week saw two public announcements that were likely very good news for green racing enthusiasts; and a feature article on the latest developments in NASCAR’s green campaign; and part three of the EcoCAR college competition is underway. Andretti Formula E has created a strategic alliance with Electric Drive Transportation Association and its member companies. The alliance’s goal is to collaborate on initiatives to advance and promote the use of electric drive technologies in mainstream applications. In addition, Andretti Formula E has named GoElectricDrive to its list of official charity initiatives. “The opportunity for EDTA and the GoElectricDrive Foundation to join forces with one of the most prestigious and successful organizations in racing history is an important milestone for the electric drive industry, and for the future of sustainable transportation across the United States,” said EDTA President Brian Wynne. Andretti Formula E will be part of the first American team named to a group of 10 racing organizations worldwide that will compete next year in the new electric vehicle FIA Formula E Championship. Last week, the city of Long Beach, Calif., announced that it will be one of 10 cities that will host the Fédération Internationale de l’Automobile (FIA) Formula E Championship series. Formula E Long Beach ePrix will be round seven of the world’s first all-electric racing series. It will take place on April 4, 2015 – about two weeks ahead of the annual Long Beach Grand Prix, which has been scheduled for April 17-19, 2015. Formula E Long Beach ePrix will take place on a shortened version of the Long Beach Grand Prix circuit in downtown Long Beach – though these electric racers will be much quieter than the usual loud and roaring engines used in Grand Prix racers. GreenBiz executive editor Joel Makower recently attended the NASCAR Sprint All-Star Race at the Charlotte Motor Speedway. During the racing event, Mike Lynch, vice president, green innovation for NASCAR, presented findings on the latest data from the NASCAR Nation survey of its rabid racing fans. The 2014 study (which updated its 2011 study) found that NASCAR fans are big supporters of renewable fuels, such as ethanol blends; 80% of NASCAR fans recycle, 66% have replaced incandescent light bulbs with more efficient ones, 60% buy energy-efficient appliances, 40% drive or own energy-efficient vehicles, and 25% use public transportation or ridesharing. Two-thirds of NASCAR fans support buying solar panels for use at home, though only 11 percent have done so to date. Compared to non-fans, NASCAR fans are about twice as likely to say their household is “very green” and seeking ways to positively impact the environment. Four out of five NASCAR fans believe climate change is taking place, and three out of four agree they have a personal responsibility to do something about it. For college students eager to participate in advanced clean technologies, part three of the national four-year competition is about to launch. EcoCAR 3 is the latest US Department of Energy (DOE) Advanced Vehicle Technology Competition (AVTC) series and considers itself to be North America’s premier collegiate automotive engineering competition. DOE and General Motors Corp. are “challenging 16 North American universities to redesign a Chevrolet Camaro into a hybrid-electric car that will reduce environmental impact, while maintaining the muscle and performance expected from this iconic American car.” During the four-year program, teams will follow the EcoCAR Vehicle Development Process aligning with GM’s vehicle development process and establishing a plan for research and development, analysis, and validation of the EcoCAR 3 vehicle design. With Toyota Motor Corp. announcing its plan to shut down at its US headquarters in Torrance, Calif., and then moving to Texas by 2017, Tesla Motors will become the largest auto industry employer in California. Tesla now employs more than 6,000 people in the state, mainly at its production plant in Fremont. 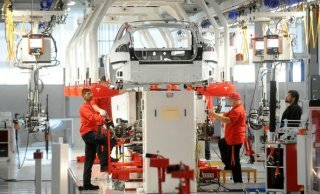 Tesla will add at least 500 more workers by year’s end in California, according to a company spokesman……. Tesla CEO Elon Musk received more media attention last week on where “gigafactories” are headed. Speaking at the World Energy Innovation Forum, Musk said the need for lower-cost batteries for autos and power storage will bring hundreds of these advanced lithium battery plants like the one Tesla is planning with fellow investors. Musk thinks cost will be reduced for these lithium-ion cells initially by 30%, but that will only get better. In other news, Tesla is getting a perhaps temporary break in the state of Missouri in the franchised dealers vs. Tesla online sales battle. Legislators have put a bill on hold until its reintroduced next year. Japanese automakers have formed a consortium similar to what’s been implemented in Europe – taking a big step forward in fuel-efficient powertrains. Toyota, Nissan, Honda, Mazda, Mitsubishi, Daihatsu, Suzuki, and Fuji Heavy Industries (which makes Subaru vehicles) have pooled resources to jointly produce gasoline and diesel engines that are 30% more fuel efficient by 2020. It’s taking place through a newly created organization, Research Association of Automotive Internal Combustion Engines. The Japanese government is putting up half the budget, which combined totals out to 1 billion yen ($9.9 million). Check out “Forty One New Models Coming,” an Automotive Digest video featuring AOL Automotive’s Steve Sturm, at the thinkLA, Automotive Breakfast 2014. Sturm thinks that hydrogen fuel cell vehicles rolling out in the next year will have a role to play in new vehicle sales. Last year’s controversy has subsided over Terry McAuliffe’s GreenTech Automotive company being the subject of a Securities and Exchange Commission for promises made by the electric carmaker while soliciting overseas investors. Its merger with VL Automotive is helping GreenTech Automotive to express optimism about delivery of electric city cars to the Chinese market. McAuliffe, now serving as governor of Virginia, started up GreenTech about five years ago. GreenTech President and CEO Charles Wang last year became embroiled in the governor’s race about the deal making McAuliffe had been part of. In this day of five million General Motors recalls being announced, 276 Nissan Leafs is a mere pittance. Nissan is recalling 211 vehicles in the US and 65 in Canada to check for a problem with its front structural member assembly. The risk of injury during a crash goes up for these models as the assembly may be missing welds, which affects structural integrity during a crash. Nissan is notifying customers and their dealers to bring in their Leafs for inspection. Lobbying for higher blends of ethanol at the national and state level is continuing. Legislators in Illinois have heard from a racing celebrity who supports the alternative fuel. NASCAR driver Kenny Wallace. “I’m here to let everyone know not to worry about it,” Wallace said. “I’ve got a lot of knowledge and it’s a clean-burning fuel. It’s good for the environment and it cuts down on emissions.” Wallace has been working with the Illinois Corn Growers Association to advocate blended fuels. Illinois currently provides tax credits for fuel with a 10% ethanol blend; the association wants to see the credit carry over to fuels with a 15% blend. The 2015 Chevy Spark EV will have an entirely new battery pack. General Motors will bring assembly of the electric Spark’s battery in-house to the Brownstown, Michigan, plant that already builds batteries for the Chevrolet Volt, Opel/Vauxhall Ampera, and Cadillac ELR. The first 1,000-plus batteries were assembled by Compact Power Inc. at a different Michigan plant, then shipped to South Korea for installation in the Spark EV. AT&T has deployed its 8,000th compressed natural gas (CNG) vehicle; the company is more than half way there to fulfill its 10-year, $565 million commitment to add approximately 15,000 alternative fuel vehicles to its fleet by end of year 2018. The 8,000th CNG vehicle – a 2014 Chevy Express van manufactured in Wentzville, Missouri – was delivered to a work center in St. Louis, Missouri, and will be used to provide entertainment and communications services in the St. Louis metropolitan area. IHS Automotive sees EV sales performing stronger than early hybrids: IHS Automotive has become the leading market analyst on auto industry trends through its acquisition of Polk and all of Polk’s vehicle registration data. A new report by IHS Automotive says that despite the limitations that electric vehicles (EVs) have faced in its early development and market availability, these models have still sold better than hybrids did in the early years starting in 2001 with the Toyota Prius and Honda Civic and Insight. “Most EV drivers still own their first-generation electric vehicles,” said IHS Automotive analyst Ben Scott. “Furthermore, there have been insufficient product offerings to effectively legitimize the market and show to consumers that EVs and plug-in hybrid electric vehicles (PHEVs) represent the way of the future.” The IHS Automotive study also says that early expectations and perceptions for EVs may been too lofty, which had a negative impact. It’s lead some people to think of early EVs as failures for not meeting their inflated expectations despite these models’ relative sales success in the global market. No doubt, ACT Expo 2014 was a success – with increased attendance and excellent keynote speakers and workshops. The challenge is reaching more fleets that need a lot more information, hands-on experience, and time with knowledgeable peers who can help them bring the right clean vehicles and fuels to their workplaces. Here are my thoughts on what could help events reach more stakeholders. I invite you to take a look at another issue of the monthly subscription version of this newsletter – Green Auto Market – Extended Edition. This newsletter offers market data and analysis on this emerging global industry. Monthly sales numbers for hybrids and electric vehicles. ​Stock market performance on green transportation publicly traded companies. Fuel prices on gasoline and diesel with comparisons to alternative fuels. Infrastructure: US fueling and charging stations. Government policies impacting the industry. Introduction of car and truck offerings in EV, hybrid, fuel cell, natural gas, propane autogas, and other emerging alternative fuels and technologies. Marketing campaigns that are reaching decision makers in consumer, business, and NPO segments. Deployment of green vehicles and fueling/charging infrastructure networks. Capital investments from public and private entities. Developments in international marketplaces impacting clean transportation. It’s $75 per year for a subscription. Got to this page for more information, and the PayPal subscription link. Fresh from his accepting the Environmental Protection Agency’s 2014 Clean Air Excellence Award for innovative programs on behalf of Florida Power & Light Co., we caught up with Claude Masters, NAFA President and FPL’s Manager of Vehicle Acquisition and Fuel. We found that Claude’s longtime enthusiasm for the potential of electric vehicles to save energy and contribute to our energy independence remains undimmed — in fact, even brighter. Tell us about some of the electric vehicle initiatives that are in the forefront right now at Florida Power & Light Co.
Our initiatives are also important for the industry as well: helping move along the fleet electrification process for not just our fleet, but for the country and the industry as a whole. How electricity is produced and used is a large component of the effort we are making to achieve energy independence. I serve on an Edison Electric Institute (EEI) committee that is writing a white paper for the CEOs of investor-owned electric companies across the country that will help them understand what fleet electrification means and why it is important to them. Vehicle electrification is further along than many think. We already have a generation infrastructure. What is not fully developed yet is the final attachment point. But that distribution network is being worked on very actively. For example, you see a lot of media related articles about what Tesla is doing. Florida Power & Light has actually helped the company with the installation of a “supercharger highway” in Florida, and we look forward to doing more of that. If you look at the electric vehicles that we have in place today, they have played an important role in helping the whole industry get to where it needs to be. For the OEMs to meet future CAFE standards, electric or plug-in hybrid electric vehicles have to be a major part of the OEMs plans. There is just no other way for them to meet those numbers without it. There have been substantial improvements in these vehicles. Take hybrids, for example. Some early models didn’t even have electric air conditioning systems. With some of the early offerings, you had to take it out of “economy mode” to run the air conditioner because there wasn’t enough volume in that market space to drive development of a cost effective electric air conditioner. Today that is a standard feature on hybrid vehicles. Moreover, all of the ancillary components — power steering, power brakes, etc., that were formerly driven off the engine are being electrified. Removing that “parasitic loss” saves 40 to 65 horsepower, making the engine that much more fuel-efficient. In today’s truck market, most of the heavy over-the-road tractors still have belt-driven water pumps, belt-driven air conditioners, power steering, etc. Eventually, electrification of these ancillary components will migrate into the heavy truck market and you will see the same thing happen. Over-the-road trucks and tractors can start downsizing their engines to make them more fuel efficient. Measured over the size of that fleet, it will be a big deal. It’s true that we need better, lower-cost batteries. Nevertheless, with today’s technology, Tesla has proved that electric cars can be successful. Tesla may not have fully solved the range anxiety issue but they have certainly diminished it greatly. It’s not uncommon in West Palm Beach or Los Angeles to go to an upscale mall or restaurant and see two or three Teslas in the parking lot at the same time. That tells you that the acceptance of those vehicles is here. Granted, not everybody can afford a Tesla today but they are certainly not any more expensive than other premium cars. Do you think Tesla has significant proprietary technology or are there other advanced battery technologies being developed? I don’t profess to be an expert on it but what I do know about the military and the defense industry is that every day their reliance on high performance batteries is increasing. There is always going to be a market for some type of advanced battery. They need to get lighter and they need to get more energy dense. It is like a race, much like any other business: whatever chemistry you use to build the battery that provides the highest energy density at the lowest price will be the winner. If you are just building batteries for cars you are probably not going to stay in business very long. If you look at a lot of the larger, successful battery manufacturers they are building batteries not only for the automotive industry, but for the aerospace industry, the medical industry, the solar industry, etc. That explains Tesla’s deal with Panasonic to jointly produce batteries. As fleets become more electrified, what will be the effect on maintenance costs and residuals? Most people don’t initially grasp the changes in residuals but when you talk about it in detail then it starts to make more sense. The reason why it is hard to set residuals on battery/electric vehicles today is because there’s so much debate about what the true life cycle of a battery is. Most manufacturers warranty their batteries from eight-to-ten years. That has more to do with the charge cycles than it has to do with actual age of the battery. The battery-life studies that the manufacturers do run like this: They cycle it, and every full discharge and recharge is considered a cycle. Most batteries are approximated to live between 3,000 and 4,000 cycles. If you used your car 300 days a year times ten years that is 3,000 cycles. They feel very confident that that battery will live for that ten year period and they feel comfortable giving you a warranty on that. Most people don’t keep a car ten years. Let’s say that you bought a ten or eleven year old vehicle and the batteries fail on it at eleven years. What we don’t know is what battery costs are going to be in eleven years. There are a lot of studies that have been done on battery costs by doing forward projections. Almost no one will tell you what the exact number is because it is proprietary information, and nobody wants to give their competitors knowledge of what their costs are. But most of the people that I talk to that do research on this say that today’s prices for a lithium ion battery, which is what most people are using, is about $450.00 per kilowatt hour. The Ford projection for that in five to seven years can vary from $150.00 to $250.00 per kilowatt hour. After a battery is not suitable for use in a vehicle, it hasn’t reached the end of its useful life. There are many applications, such as solar power, where they can be put to perfectly good use. Beyond that, the battery materials themselves can be recycled. A secondary market in batteries is already beginning to develop. When the Prius first came out over ten years ago, people said the Prius was not going to have any residual value because nobody is going to want to buy one. They don’t know what is going to happen to the batteries. Well, today there is a great secondary market for Prius. Its residuals are typically higher than a comparable vehicle in its class. The one thing that everybody does agree on is that you do see a reduction in maintenance cost. But most people have not had electric vehicles in operation long enough to do a ten year comparison or comparative analysis, so that part has not been agreed upon. There are some Six Sigma tools that you can use to do projections. But, again, everybody agrees that your typical electric car has about one-third of the components of a conventional internal combustion engine vehicle. Typically you are talking about no transmission, no cooling system, and no exhaust system. On the heavier-truck side of it, the exhaust system profile for a medium- or heavy-duty truck is a big expense — $7,000-$10,000 worth of after-treatment devices on a truck that you didn’t have ten years ago. That is a big cost component. Summarizing what we’ve talked about, can you give us your predictions for vehicle electrification? Predictions are always dangerous, but certainly in 30 or 40 years, maybe sooner, we will probably be looking at vehicles that have electric motors to propel the vehicle, in conjunction batteries or with some type of power system such as a hydrogen cell reformer that generates the needed electricity. Electric motors —however they are powered, by batteries, or fuel cells, or even an onboard generator, have a significant edge in efficiency. In a conventional gasoline engine, only 30 to 40 percent of the energy actually makes it to the drive wheels; with an electric motor it is 100 percent. We still need higher-energy-density, lower-cost batteries. In summary, vehicle electrification is a really big deal to our industry and to the country. I think it is going to play a major role in the transportation industry for the future, and I am going to do everything I can to help support that. It looks like Smith Electric Vehicles will still be there – and it wasn’t looking too good not so long ago. 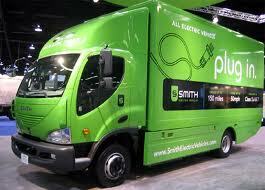 Smith Electric, which produces all electric medium-duty commercial vehicles, has secured a $42 million investment from Sinopoly Battery Limited, a global supplier of lithium-ion batteries and related EV products. Sinopoly will be the exclusive supplier of batteries for Smith Electric vehicles (and vehicle applications compatible with Smith Electric platforms). The supplier will also provide EV components that will be manufactured at its Hangzhou, China, facility. Smith Electric will resume production in its Kansas City, Mo., facility in mid-summer 2014. The company recently suspended production to transition its supply chain to Tier 1 suppliers; that will enable Smith Electric to produce its vehicles at a lower cost, the company said. AC Transit (Alameda-Contra Costa Transit District) in Oakland, Calif. is considering removing fuel cell buses from its fleet, according to an anonymous source. Transit districts have been a testing ground for alternative fuel vehicles; AC Transit has been testing out a fuel cell demonstration program since 2000 and has been considered to have the most comprehensive program in the US. The transit agency currently operates 12 third-generation fuel cell buses powered by a 120 kilowatt fuel cell power system. New York has modified the list of trucks that are eligible under its $19 million Voucher Incentive Program. Hino’s 195h and 195h-DC diesel electric cab-over has been approved for the program and the list also includes OEMs such as Daimler Trucks North America, Isuzu, Peterbilt, and Volvo. Toyota is wrapping up its deal with Tesla Motors to buy Tesla battery packs and motors for the Toyota RAV4 EV by the end of the year. In May 2012, Toyota, which owns 2.4% of Tesla Motors, said it would buy components for 2,600 RAV4 EVs over three years. That deal had produced $15.1 million in revenue for Tesla in the quarter that just ended. The RAV4 EV has never sold very well, and Toyota will be taking it out production later this year. This comes soon after Tesla announced first quarter 2014 performance – producing a record 7,535 vehicles and delivering 6,457 of them. On the state battle front, Tesla says its ready to fight in Missouri to sell directly to consumers; a bill looks like it will be introduced in the state to bar Tesla’s company-owned store system. Dates for the next AltCar Expo have been released: Friday, Sept. 19 and Saturday, Sept. 20, 2014, in Santa Monica ,Calif.
Navigant Research has launched the Transportation Forecast Research Service, an information and forecasting service that will focus on electric, stop-start, natural gas, fuel cell, propane and conventional vehicles. It’s part of Navigant’s Smart Transportation program. General Motors’ Project Driveway has passed the three million miles of hydrogen-powered driving. It’s fleet of Chevrolet Equinox fuel cell vehicles have been driven by over 5,000 drivers who’ve given feedback on their experience. Some of the crossovers have traveled more than 120,000 miles and the fleet has saved 157,894 gallons of gasoline consumptions. General Motors announced pricing for its 2015 Chevrolet Impala bi-fuel model that can run on CNG or gasoline — $38,210 including destination. That makes for two CNG-powered production cars in the US with the Honda Civic Natural Gas. Cal State University, Los Angeles last week opened the largest hydrogen station operated by a university in the US. Texas will be offering $2,500 rebates to buyers of plug-in electric vehicles. It was approved by the state legislature last fall with in intended spring 2014 start date. Chrysler Group is recalling 4,100 Fiat 500 electric cars; a power inverter module on 2013-2105 Fiat 500e may be experiencing coolant seepage that causes power loss while driving – a short circuit leading to power loss. Chrysler says there have so far been five incidents but no fires. Mahindra Group is investing in a 37,000 square-foot facility in Ann Arbor, Mich., to the produce the all-new GenZe electric scooter. It’s still not been made clear when the functional, lightweight scooter with plenty of baggage carrying space will be available for sale in the US. BMW Group’s factory in Moses Lake, Wash., will be getting an investment of $200 million from BMW and SGL Group to triple capacity of its carbon fiber plant. It will be the world’s largest producer of car bon fiber with an annual output of 9,000 tons by 2015 once expansion is completed. BMW’s i3 and i8 are built with carbon fiber reinforced plastics to increase their range and efficiency. Alternative, clean transportation appears to be gaining support – as evidenced last week during ACT Expo 2014 at the Long Beach, Calif., convention center. Now in its fourth year since inception, the conference’s attendance was up – perhaps as many as 4,000 attendees, making it the largest event of its type in the US and perhaps the world. ACT Expo keynote speakers, workshops, ride and drive, and an expanded exhibit hall, featured the latest in alternative fuel vehicle technology, the regulatory environment, and cost-benefit analysis by fleets. ACT Expo has become something of a broad platform for fuels, vehicles, and technologies of all types to be well represented, and for stakeholders in these industries to network. The American Trucking Associations worked with organizers of the event for the first time this year; NAFA Fleet Management Association also played a key organizing role along with the US Dept. of Energy’s Clean Cities, the US Environmental Protection Agency (EPA), and the EPA’s SmartWay Transport Partnership. Another innovation launched this year was co-located events. Propane Education & Research Council was one of the leading sponsors of the event and held its “Lead the Way” propane autogas summit; NGV Global held its annual conference in tandem with ACT Expo and led a Technical Forum; California Hydrogen Business Council held its spring summit there; “Alternative Fuel Toolkit for Local Governments, Fleet Managers, and Employers Workshop” was presented by another leading sponsor, South Coast Air Quality Management District; and “Women in Alternative Clean Transportation Summit” was organized by ACT Expo management firm Gladstein, Neandross & Associates. There were a few field trip events coordinated with ACT Expo as well, including a heavy-duty natural gas tour with site visits to the Clean Energy station at Port of Long Beach and the Waste Management Carson station featuring LNG and CNG fueling. The kickoff keynote speaker during Tuesday’s luncheon was Dennis Slagle, executive vice president group truck sales & marketing Americas, Volvo Group. The truck manufacturer aims to be the world leader in sustainable transportation through its Volvo, Mack, UD, Prevost, Novobus, and other heavy duty truck and bus brands. Volvo operates a comprehensive green vehicle portfolio in transport with natural gas, clean diesel, dimethyl ether (DME), and bi-fuel vehicles. Volvo is working with Cummins on bringing in a 13 liter LNG engine next year. Slagle called for a common sense regulatory approach in Washington, and asked for renewal of expired tax incentives. Erik Neandross, CEO of event organizer Gladstein, Neandross & Associates, led a panel right after Slagle’s presentation featuring prominent leaders in the industry. Clean Energy Fuels president and CEO Andrew Littlefair gave some interesting statistics including heavy duty trucks using 25 billion gallons of natural gas last year, taking the lead, by far, as a user category. There are 19 million natural gas vehicles in operation globally today, but only 142,000 are in the US. There is a lot happening out there, and Littlefair made reference to supermarket giant Kroger’s announcement that day on how it replaced 40 diesel trucks with that same amount of LNG trucks in Oregon. Propane Education & Research Council (PERC) president and CEO Roy Willis said that in addition to light and medium duty trucks, propane is being widely used in material handling, generators, irrigation, and landscaping (such as mowers). There are about 600,000 propane-powered forklifts in operation in the US. There are about 140,000 propane-powered passenger and commercial vehicles on US roads; as for sales, there were about 14,000 units sold in the US last year (about half OEM and half conversion); 75% are light duty (mostly pickups and police cars) and 25% are medium duty including school buses. PERC forecasts that there will about 18,500 propane autogas vehicles sold in the US this year and about 25,000 in 2015. In a separate interview, Willis said there’s a strong sense of momentum being experienced in propane autogas, even with expiration of the fuel tax credit at the end of 2013. Direct injection engines are holding a lot of promise; Willis talked about the PERC project with Southwest Research Institute, Ford, General Motors, and Hyundai on direct injection. 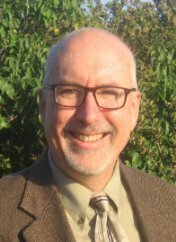 National Biodiesel Board CEO Joe Jobe talked about the ongoing battle in Washington – and how oil industry spokespeople are lobbying with misinformation about the Renewable Fuel Standard (with examples being shown in video segments) while also covering up their abundant federal subsidies. States are opening up to biodiesel such as Minnesota mandating that 10% of its diesel will soon be biodiesel. Via Motors chairman of the board Bob Lutz championed the breakthroughs electric vehicles are on the cusp of experiencing. He said that next-gen, lithium-sulfur batteries will have five times as much energy density as lithium-ion batteries. Alex Freitag, director of diesel systems engineering at Robert Bosch, led a panel on light-duty diesel as a growing alternative. The 20% to 30% of fuel efficiency gains, along with huge reductions in NOx, hydrocarbons and particulate matter, have made diesel-powered vehicles much more viable for fleets and for consumers in the US. Mike McGarry, fleet product planning manager and green fleet support at General Motors, and William Craven, general manager of regulatory affairs at Daimler AG/Mercedes-Benz, discussed investments OEMs are making in clean diesel options. Advancements are being made in diesel technology, Freitag said, including thermodynamic optimization, turbochargers, idle reduction, and stop-start systems. As for biodiesel, OEMs are supportive of the alternative fuel but need to feel confident in the quality of the fuel before they embrace it, McGarry and Craven said. ACT Expo 2014 hosted a ride and drive on Wednesday afternoon last week. Vehicles included an EVI medium-duty electric truck and a VIA Motors eRev extended range van; a propane-powered Ford E-Series van; fuel cell vehicles such as the Mercedes F-Cell and Honda FCX Clarity; natural gas vehicles such as the Honda Civic Natural Gas and Volvo VNL CNG tractor; and two clean diesel vehicles – the Chevrolet Cruze Turbo Diesel and Chrysler Jeep Grand Cherokee with EcoDiesel. Penske led a panel discussion last week at ACT Expo 2014 on the U.S. Environmental Protection Agency’s (EPA) SmartWay Transport Partnership. Drew Cullen, Penske vice president of fuels and environmental affairs, moderated the panel that included EPA SmartWay’s Tracie Jackson-Hall and Joe Ringhoffer, director global sourcing at Penske Logistics. In April, Penske Truck Leasing repeated its win as one of 10 companies named in the EPA SmartWay Affiliate Challenge Award; Penske was also cited for its strong marketing efforts. The EPA acknowledged Penkse for doing an exceptional job in promoting the partnership’s freight sustainability goals. Penske Truck Leasing has been assisting its customers in implementing SmartWay objectives including establishing fuel economy and emissions benchmarking; and has been educating customers on implementing SmartWay strategies into their own operations. “It is in our company DNA to not only be good environmental stewards ourselves, but to also aid customers in identifying, quantifying and implementing sustainable transportation solutions,” Cullen said. Last October, Penske Logistics was a recipient of the 2013 SmartWay Excellence Award for being an industry leader in freight supply chain performance energy and efficiency. Penske earned this award in part for reducing its annual carbon dioxide emissions by 25%, nitrous oxide emissions by 40%, and particulate matter emissions by over 50%. Penske works with customers using the SmartWay tools to improve environmental performance and quantify emissions calculations. Onboard technologies and alternative fuels are explored to improve fuel economy and improve the fleet’s efficiency. One of the workshop panelists, Chip Dorger, general manager at Letica Resources, explained how integrating the SmartWay program has meant less miles traveled, less fuel used, and CO2 reduction in total tons transported per year. Along with C02 reductions, SmartWay tools assist fleets in reducing NOx and particulate matter. Offering customers compressed natural gas Freightliner Cascadia semi-tractors has been part of Penske’s sustainability initiatives, Cullen said. Penske Truck Rental has 85 compressed natural gas (CNG) Freightliner Cascadia semi-tractors available for commercial rental use in select markets. Penske works with customers to explore the environmental and economic benefits of going with CNG-powered trucks. There are challenges of going with these trucks – CNG trucks have less range than diesel-powered trucks and the tanks do take extra space; Penske works with customers to see when it makes sense to go with CNG. There is the potential to break even or to save two-to-three cents per mile; there’s been a lot of interest in these alternative fuel vehicles by food service, linen, and dry cleaning fleets, Cullen said. During ACT Expo, Penske Truck Leasing also announced that it has been awarded grants totaling $525,000 through the South Coast Air Quality Management District’s Mobile Source Air Pollution Reduction Review Committee (MSRC) in Diamond Bar, Calif. Seven Penske facilities in Southern California have been awarded $75,000 grants to modify the facilities to provide maintenance services on trucks with natural gas-powered engines. “These facility retrofits will enable us to better serve our truck and fleet customers in the region and support their sustainability goals now and in the future,” said Jennifer Sockel, senior vice president of administration and facilities for Penske Truck Leasing. These California grants are assisting Penske in working with customers on reaching their sustainability goals, Sockel said. CNG retrofits can become expensive; Penske works with customers on implementing options such as aggregate use and consolidating facilities, or trial use with a small percentage of the fleet. Staff training is also offered by Penske for maintenance of these engines, and for working safely on the vehicles. Working on CNG trucks is quite different than the diesel trucks they’re used to servicing, so training is needed by maintenance staff. Penske has also received a grant from the Pennsylvania Department of Environmental Protection for the purchase of 23 CNG vehicles. The Natural Gas Vehicle Program in Penske’s home state of Pennsylvania is helping to support development of a new CNG fueling infrastructure, Cullen said. Penske is working with customers on exploring options in CNG trucks and fueling, such as analyzing dynamic roadway routes. Pennsylvania is encouraging fleets to deploy CNG trucks in counties with poor air quality. Customers are now looking at when it makes sense to go with CNG, Cullen said. The Nissan Leaf continues to lead the plug-in electric vehicle space, selling 2,088 units in the US during April – compared to the Toyota Prius Plug-in bringing in 1,741, the Chevrolet Volt selling 1,548, and Tesla selling about 1,400 of its Model S units. While Leaf sales were down nearly 17% from March, they were up nearly 8% over April 2013 and were one-third higher than that same four month period during 2013. The previous neck-and-neck race between the Leaf and Volt appears to be going Nissan’s way. Volt sales for the first four months of 2014 are down about 7% from that same time period in 2013. Toyota is seeing different results in the plug-in hybrid segment – its 2014 Prius Plug-in sales figures are up 70.6% over the first four months of 2013. Toyota’s hybrids were down in sales from March, but still accounted for four of the top five in April sales figures. The Toyota Camry Hybrid was up 20.2% in sales over April 2013 and the Prius C was up 2.4% over that same time period. The Hyundai Sonata Hybrid saw the largest sale gain among top-selling hybrid models last month; at 2,055 units sold in April that was 42% over a year ago. As for clean diesel passenger cars, the Volkswagen Jetta lead the pack – 4,355 units sold in April, up 7.5% over March and 37.9% over April 2013. Here’s a correction to the news item last week on ClipperCreek co-founder and former President Dave Packard taking on a new job with ChargePoint. Packard is now running ChargePoint’s utilities business development. He will not be leading ChargePoint as a whole, which was incorrectly reported last week. Tesla Motors will soon be naming at least two US states for its upcoming “gigafactory” battery manufacturing plant. Tesla is getting ready to product lithium ion battery packs that may coincide with the launch of its first affordable mass-market electric car. Electric Car Guest Drive, a California-based initiative, is offering consumers an opportunity to get behind the wheel and experience driving and electric vehicle. Events are being hosted throughout May in 12 California cities. Details can be found on its website. It’s been set up by a car club called EV Quorum. EV owners are offering others a chance to try out just about any EV you can think of – and it’s much more than the typical driving experience you’ll find at dealerships. Schneider Electric and ChargePoint yesterday announced a collaboration to unveil Schneider Electric’s new EVlink™ cloud connected charging stations with the ChargePoint network. It includes hardware, software, ChargePoint connectivity and advanced services such as installation, deployment planning, project management, and ongoing maintenance. The collaboration will serve host station owners and electric vehicle drivers. “With this partnership, Schneider Electric makes it easier for EV drivers and station owners to leverage ChargePoint, the world’s largest and most open EV charging network,” according to the press release. If you’re looking for a domestically grown plant offering environmental and economic benefits, how about hemp? Twenty-three states have now adopted supportive hemp legislation and it’s becoming well understood that it contains little to no THC like its same-species cousin marijuana. Some of the benefits include: a 2009 University of Connecticut study found that hemp seed oil made a viable and attractive feedstock for producing biodiesel. Lotus has practiced using hemp in its composite body panels and spoiler since 2008, leading to many automakers switching to hemp composites from plastic for door panels and other components. Environmentalists appreciate that hemp absorbs CO2 while it grows through natural photosynthesis; and economists like that fact that hemp imports are declining and that the US has a strong change of creating domestic jobs and financial gains – Canada’s hemp industry is expected to bring in a billion dollars in earnings this year. The 2014 Mercedes-Benz B-Class Electric Drive is set to show up this summer at US showrooms. It’s powered by a Tesla Motors-developed electric motor and a 28-kilowatt-hour lithium-ion battery pack. It starts with a base price of $41,450. Volvo and Google are taking the self-driving car to the next phase – city street driving. “Drive Me” has begun testing in 100 cars on the streets of Volvo’s home base in Gothenburg, Sweden. That follows several years of test drives on freeways by Google. IBM has made a revolutionary claim – that it can create “an affordable photovoltaic system that can concentrate solar radiation 2,000 times.” IBM is working with other researchers on a High Concentration PhotoVoltaic Thermal system that can convert 80% of incoming solar radiation into useful energy. The US Supreme Court has overturned a lower court ruling that brings back the US Environmental Protection Agency’s Cross-State Air Pollution Rule; it’s a regulatory structure in 28 eastern US states that requires states to cut emissions that cause downwind states to exceed the EPA’s air quality standards. It’s considered a landmark win for the Obama administration and public health advocates. The program had been stopped in August 2012 by a federal appeals court in a case initiated by utilities and several states. That Supreme Court ruling happened right before President Obama’s long-awaited climate change report, which will be released today; so, it’s a very interesting time for federal environmental policy.